Cardinal flower, Lobelia cardinalis, is a native American plant that is often used as an ornamental garden plant. This showy species in the bellflower family (Campanulaceae) has a wide distribution, throughout the eastern US (including Wisconsin and Minnesota) and from southeastern Canada through Mexico and Central America to northern Columbia in South America. 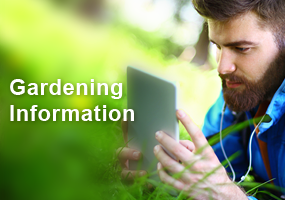 It is found in moist soils, including wet open woods, streambanks, swamps and marshy areas. It was introduced to Europe in the mid 1620’s where it earned its common name, likely because the bright red flowers – variously described as scarlet, crimson, or vermilion – are the same color as the vestments worn by Roman Catholic cardinals. It is hardy in zones 3-9. 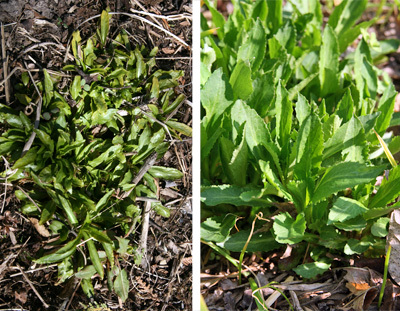 The basal leaves in spring (L) and early summer (R). This herbaceous perennial produces clumps of basal leaves. The alternate, lanceolate leaves, up to 6″ long, have a toothed margin. They may be a medium green or slightly bronzed or purple-tinged, and very shiny. 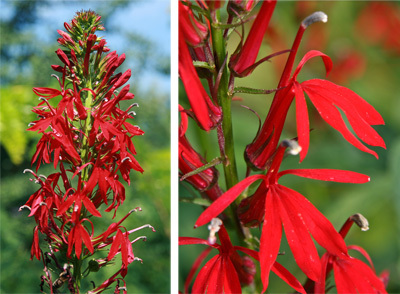 Cardinal flower produces leafy inflorescences 3-6 feet tall from midsummer to fall. The flowers are a brilliant red. Each erect terminal raceme is covered with numerous five-lobed flowers. The flowers open from the bottom to the top over a period of several weeks. Each 1-2″ flower has three spreading lower petals and two upper petals that are all combined into a tube at the base. There are 5 stamens fused into a tube surrounding a 2-lobed stigma in the middle of the petals. The petals are generally a brilliant red, although some white or pink forms occur in nature. 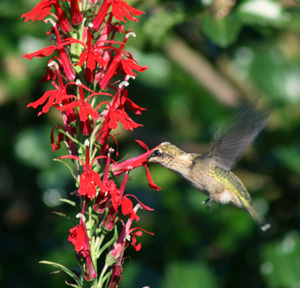 Cardinal flower is highly attractive to hummingbirds. The bright red flowers are pollinated by hummingbirds and are enormously attractive to these birds. Butterflies and bees will also visit the flowers. It is also good for cut flowers, but the stems do have a milky sap. The flowers are followed by capsules containing numerous small seeds. Under the right conditions cardinal flower will readily self seed. 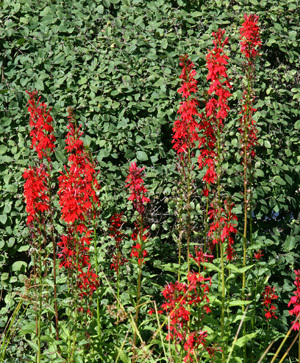 Use cardinal flower in borders, rain gardens, and native gardens, especially on the edges of streams or ponds. They will naturalize in moist meadows and can be grown in a shallow water garden or in containers. The deep pure red flowers may be difficult to combine with other reds, but it mixes well with many other moisture-loving plants that bloom in other colors. Cardinal flower is great for moist spots. It combines well with great blue lobelia (another native, L. silphitica, which blooms about the same time), irises, marsh milkweed (Asclepias incarnata), monkeyflower (Mimulus sp.) and rose mallow (Hibiscus moscheutos). Other native plants it may be found with include purple coneflower (Echinacea purpurea), blazingstar (Liatris spp. ), and Penstemon digitalis (foxglove beardtongue). 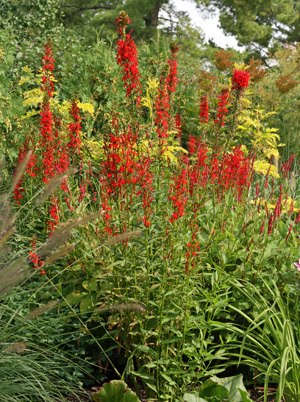 Lobelia cardinalis is easily grown in moist soils in full sun to partial shade. It has few pests and is not favored by deer or rabbits. 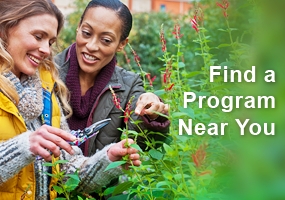 Flower stalks may need to be staked depending on the exposure to strong winds. It is considered a short-lived perennial, because it will die after blooming, although offsets will continue growing to perpetuate the plant. It can be propagated by division, removing the young plants that develop around the perimeter of established clumps, or can be grown from seed. 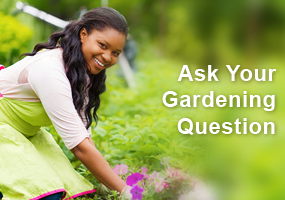 Plants often reseed on their own, or seed can be sown on the soil surface (they need light to germinate). Should I remove dead foliage from my cardinal lobelia in the spring, do I need to prune or cut it back?